You can make an online gift with a credit card at any time when visiting www.centumtech4kids.ca. It’s easy, and tax receipts are issued for gifts $20 and higher online at the time of the donation. Once you have located your personal page, you can send that link to your family and friends and they can donate directly to your page as well. For every mortgage transaction, you commit to donating $10 to Easter Seals in the name of your client. You can make that donation online at www.centumtech4kids.ca and receive your tax receipt at the time of each transaction or donate through your office and receive a manual tax receipt. Then – to let your client know you have made this donation in their honour, you can send a personalized Ecard to their email address. Just click here to access cards. Your personal and office fundraising pages are already set up so you can start donating right away at www.centumtech4kids.ca. Crowdfunding is everywhere and you too, can become a successful fundraiser using the crowdfunding platform on www.centumtech4kids.ca. Once you have found your personal page on the site, all you do is register to initiate your campaign, set your fundraising goal and you’re off to the races. It’s that easy. You can upload photos, video, customize the content on your page and send the link to all your friends, family and colleagues. Have them participate in your successful campaign – if everyone gives a little – it won’t take long before you have surpassed your personal goals. For example, say you’d like to start a campaign to raise $2000 in support of a much-needed piece of assistive technology. All you do is create some content about your goals, send the link to your page to all your friends and family, and they will arrive back at your page, ready to donate in support of your efforts. Contact lmckeen@easterseals.ca if you would like any assistance starting up your campaign. For over 10 years, superheroes across Canada have been rappelling off high buildings– all to raise funds for Easter Seals. 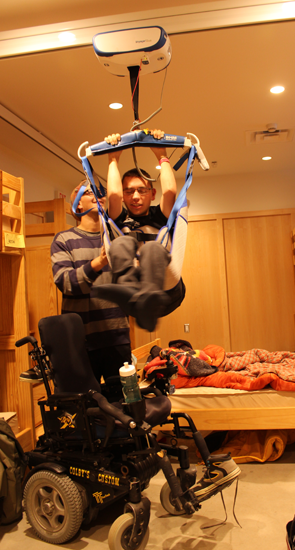 For more than 90 years, Easter Seals has challenged Canadians with disabilities to live life actively, embracing opportunities and pushing boundaries to contribute to the well-being of themselves and their communities. The Easter Seals Drop Zone once again challenged participants to do the same! With hearts pounding, pulses racing and knees shaking, more than 820 daring participants challenged themselves and changed lives, by participating in 14 local Drop Zone events across Canada. Each rappeller must raise between $1,500 and $2,000 (depending on location) through online and offline donations in order to participate. Thanks to a monumental effort and the generosity of all our rappellers, sponsors, donors and volunteers, the 2016 Drop Zone raised more than $1 million – helping to ensure that all Canadians with disabilities have access to the life-changing equipment, technology, programs and support services they need to make the most of their abilities. Here are the locations and dates for the 2017 Drop Zone Campaign. Visit www.thedropzone.ca and sign up as a CENTUM rappeller; all your fundraising during the Drop Zone will be allocated to your personal page at here at www.centumtech4kids.ca.